A deposit is required upon booking. Balance payment is to be paid in full minimum 14 to 30 days prior to departure. If full payment is not received 14 days or more prior to departure, kenya Bush expeditions tours and travel reserves the right to forfeit the deposit and cancel the reservation. A deposit is required upon booking. Balance payment is to be paid in full upon confirmation of flight reservation and land arrangement before issuance of travel documents. Any booking that is not confirmed by the customer within the airlines required ticketing deadline may result in seats being cancelled by the airline, unless ticket(s) have been issued prior to the ticketing deadline. A deposit is required upon booking. Balance payment is to be paid in full one month before departure. For tours or components supplied by third parties, e.g. cruises, Insight Vacations, Contiki, hotels, airlines, car rentals, trains etc., cancellation charges under the terms and conditions of the respective third parties shall apply, plus a handling chargeof S$50 per service per person. Tour members should be aware that kenya Bush expeditions tours and travel is acting as an agent for the service suppliers. After a deposit or full payment is made, all arrangements are still subject to final confirmation. When the arrangement cannot be confirmed, kenya Bush expeditions tours and travel will endeavor to notify customer at least 2 weeks (for group tour and tour of 7 days and above), or 1 week (for tour of 6 days and below) before departure, and a refund of payment of tour fare will be made if the tour is cancelled. Kenya Bush expeditions tours and travel shall not be liable for any further responsibility. Kenya Bush expeditions tours and travel reserves the rights to cancel any tour prior to departure for any reason, including but not limited to, an insufficient number of participants. Kenya Bush expeditions tours and travel may, if it so decides, recommend alternative tour arrangements. Kenya Bush expeditions tours and travel shall endeavor not to make any material alternation to the tour package. However, kenya Bush expeditions tours and travel reserves the right to make minor changes at any time due to unforeseen circumstances without compensation, especially during peak season. Hotel accommodation based on twin or triple-sharing. When booking triple-sharing rooms, please note that the third bed may be a ‘roll-away’ bed. Single room occupancy is at an additional cost. All meals are as specified in the itinerary. If selected carrier’s flight time does not allow for certain meals to be taken, there shall not be any refund for meals not consumed. Baggage allowance of 20 kilos per passenger. All taxes and fuel surcharges imposed by relevant authorities and airlines. Meals, beverages, room service or any other item not listed in the itinerary. Excess baggage charges, laundry charges, travel insurance, and all items of a personal nature. Gratuities to driver, tour guide, tour leader, hotel porters etc. Tour prices are based on current airfares, service fees, government and airport taxes, fuel surcharges and exchange rates, applicable at the time of print and quotation, and are subject to changes without prior notice. Any difference in tour prices due to new regulations being effected or late instructions by the customer to issue travel documents will be borne by the customer even after full payment had been made. Any non-compliance may result in automatic cancellation of reservation and forfeiture of your payment. Child fare is based on sharing a room with adults and no additional bed will be provided. There will be an additional cost for child sharing one room with an adult or when an extra bed is required. If there are any requests regarding special meals, dietary requirements, adjoining rooms etc., please inform kenya Bush expeditions tours and travel when booking. Such requests are subject to confirmation and availability. All customers are strongly recommended to purchase travel insurance to cover such areas as trip cancellation, personal baggage, personal accident, injury & illness. Under no circumstance is kenya Bush expeditions tours and travel to be construed as a carrier under contract for safe carriage of customer or his/her baggage & belonging. Our staff will be pleased to assist in the enquiries of any travel insurance. Extension of stay/deviation may be permitted at the end of tour, subject to maximum validity and restrictions of air ticket, seat confirmation and availability of hotel prior to commencement of tour. It is the customer’s responsibility to hold firm confirmation for their return flight. When extension of stay/deviation cannot be confirmed three weeks prior to the group’s departure date, the customer is deemed to be taking the original tour schedule. In the event that the original arrangement has been changed by kenya Bush expeditions tours and travel during the process, any extra cost will be borne by the customer. It is the customer’s sole responsibility to ensure that his/her international passport has a validity of at least 6 months from the date of return, and that relevant visas, ESTA, vaccinations and travel documents are gotten. For Singapore Permanent residents, please bring along your exit permits when travelling. Where possible, kenya Bush expeditions tours and travel will assist the customer to obtain the necessary visas. Service charges and visa fees will be borne by the customer. 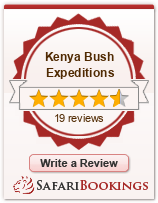 Kenya Bush expeditions tours and travel does not guarantee the approval of the visa application. If, for any reason, application for visa or exit permit is rejected, a full refund of all monies paid (excluding visa application fees) will be made if the result of the rejection is made known to kenya Bush expeditions tours and travel at least 35 days prior to departure. If less than 35 days’ notice is given, the relevant cancellation charges as stated, plus other charges if applicable, will apply. Kenya Bush expeditions tours and travel cannot be held responsible for any expense, reimbursement or refund of tour or travel arrangement charges if any customer is refused entry or transit by any country at any point during the tour or travel for whatsoever reason, including but not limited to, lack of necessary visas. Kenya Bush expeditions tours and travel and its associates act only as an agent for the transportation companies, hotels & other principals for the tour programs. They accept no responsibilities for injuries, damage, accident, loss, delay, theft, quarantine, customs regulation, strike, changes in itinerary, deportation or refusal of entry by Immigration Authorities resulting from improper travel documents, possession of unlawful items or irregularities that may be caused to person or property. Any loss & expense are the responsibility of the customer. All proper travel documentation are the sole responsibility of the customer. Kenya Bush expeditions tours and travel reserves the right to alter itineraries, travel arrangements, hotels reservations etc. If it is necessary or in the case of force majeure, kenya Bush expeditions tours and travel reserves the right to cancel any tour prior to date of departure for any reason, including insufficient number of participants. Should this happen, the entire payment shall be refunded without further obligation on the part of kenya Bush expeditions tours and travel. Kenya Bush expeditions tours and travel will recommend alternative tour, preferably to the same destination or other destinations. Should customer decide not to accept the alternative, all monies paid shall be refunded in full by kenya Bush expeditions tours and travel without further obligations. Kenya Bush expeditions tours and travel also reserves the right to require any individual to withdraw from the tour if it is deemed that his/her act of conduct is detrimental to or incompatible with the interest, harmony and welfare of other passengers and the tour as a whole. Kenya Bush expeditions tours and travel shall be under no further liability thereafter to any such person. No tour leaders/guides or other employees or agents of kenya Bush expeditions tours and travel are authorized to commit kenya Bush expeditions tours and travel to any liability whatsoever and kenya Bush expeditions tours and travel will not be bound by any statement or representation unless in writing and signed by a Management Executive of kenya Bush expeditions tours and travel. Kenya Bush expeditions tours and travel reserves the right to take photographs and films of customers while on tour with kenya Bush expeditions tours and travel to be used for brochure advertising or publicity material without obtaining any further consent from customers. Kenya Bush expeditions tours and travel shall not be liable to the customers for any goods purchases by the customers during the tour, whether or not the goods are of defective quality, not suitable for the customer’s purpose, not in conformity with sample provided to the customers or rejected by the customer for any reason whatsoever, notwithstanding that the goods are purchased in shops which comprise part of the tour package (including itinerary), or which are specifically recommended by the travel services, their guides, servants, employees or independent contractors, nor kenya Bush expeditions tours and travel or the travel services be liable to the customers for the purchase monies of the aforesaid goods. Any complaint/claim must be made in writing within 2 weeks from the date of return to Singapore on the last day of the tour itinerary. No responsibility is accepted in respect of any complaint/claim which is not so made. Kenya Bush expeditions tours and travel will acknowledge the receipt within 3 working days and reply to the customer within 21 days. Kenya Bush expeditions tours and travel advises customers to approach NATAS or CASE should the complaint not be resolved within the time frame. Kenya Bush expeditions tours and travel only collects the necessary customers’ data to fulfill the purpose of completing every sales transaction and future in-house marketing. Kenya Bush expeditions tours and travel will not disclose, share, transfer, sell or rent the data collected to third party.